I had no idea that the Hughes Helicopter can fly over 1,860 miles on a single tank of fuel. 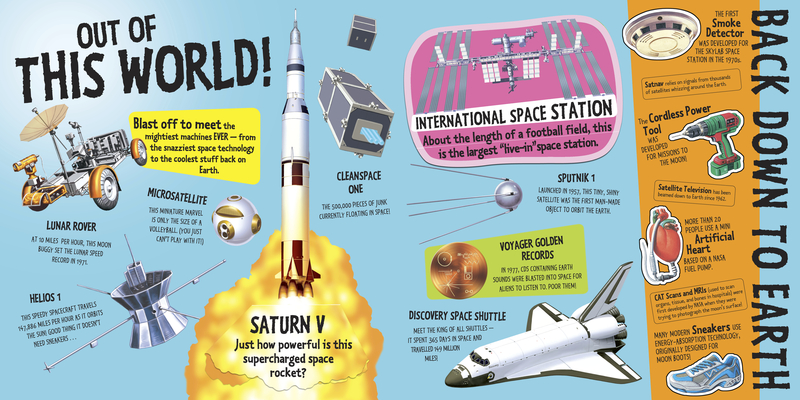 I was surprised to learn that there are 500,000 pieces of junk currently floating in space. And I was even more surprised to learn that CAT Scans and MRIs were originally developed by NASA through their attempts to photograph the surface of the moon. I have learned more about machines, engineering, and construction from having a very curious child than I ever did from teaching physics. There are so many times I wish I could go back in time and show my introductory physics students picture books to help them understand and grasp important concepts; this book certainly would have been one of them. While it doesn’t exactly teach high-level physics or engineering, it does something possibly even more important: it gets you excited and gives you an accessible context about the mechanical world that we live in. After reading this book, I have a greater appreciation NASA’s contributions to our daily life. Mechanical Marvels is fascinating and fun — regardless of your inclinations towards machines. This book is accessible, interesting, and engaging to all. 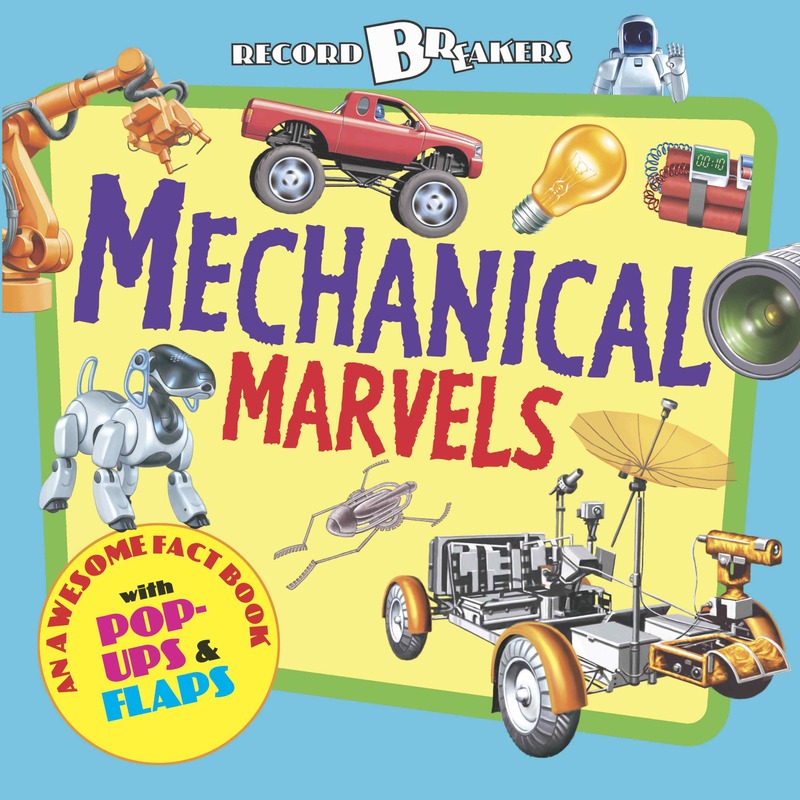 Mechanical Marvels covers a wide variety of topics from space shuttles to chainsaws, potato clocks to robotic mops, Gutenberg’s Printing Press to a Giant Mechanical Spider and more. Each topic is presented in bright, clear, and engaging illustrations alongside short sentences that give interesting tidbits of information. Also, on each page there are flaps to lift and several pages have moving pop ups. It is extraordinarily well-designed and it presents a huge amount of information in relatively few pages. Due to the pop ups and lift the flaps, this book is definitely geared for the age five and above crowd (the back of the book says six). My littlest one is constantly trying to get his hands on it — so we have to be diligent about keeping it out of reach until it is older. While the pages are reasonably sturdy and can sustain a lot of readings — there are tempting parts to grab at and rip for the littlest of littles. When I saw this book, I knew immediately that my construction-engineering-all-things-mechanical son would adore this book. I am also genuinely pleased at how much I adore this book. My son asks me to read this book to him regularly and I also find him looking through it by himself quite often. He’s asked me a lot of questions during and after reading this book and he’s certainly sent me on some internet-research adventures as I try to find out the answers for him. I’m thrilled with this book and I’m impressed with how well the author and illustrators have balanced information with entertainment. They’ve created a book that is inspiring, informative, and a great deal of fun. It gives a engaging context to everyday things and an everyday context to extraordinary things. It’s a fun book and I’m so glad it found its way to our home. I hope you get a chance to check it out soon. Recommended Ages 5 – 10. Little Bee Books. March 2015. 18 pages. ISBN:978-1499800173. Nonfiction. [Library] Worldcat.org — ask your library to order it. From ‘Mechanical Marvels’ © 2013 The Templar Company Limited. This edition, little bee books. Used with permission. This is a great book for kids who like to figure out how things work. I have a grandson like that.